Although perhaps lesser well known, mason bees are in fact a better pollinator than honey bees (around 160 times more so according to some sources). Mason bees are also not very aggressive, only stinging when handled or under distress. The mason bee sting is not painful and their stingers are not barbed. Mason bees rarely show aggression and will not sting to protect their nest. This article will give you an in-depth understanding of how to attract mason bees and keep a strong healthy mason bee colony going. Mason bees are closely related to honey bees, but they do not make honey. Mason bees get their name from their characteristic behavior of using mud like bricks to build their nests. They are a great alternative to keeping honey bees. When Do Mason Bees Emerge? With the number of bees declining significantly worldwide, you do not have to resort to hand-pollination. Keeping mason bees is an easy and safe way to have your own pollinators for your plants. Mason bees live in houses called nests. In attracting mason bees, you should consider their habitat and the resources they need around them. With a good nest and enough forage resources, you can easily attract mason bees and keep them. You may make your own nest or purchase an already made mason bee house. Commercial mason bee houses and nests tend to last longer than homemade ones. With a nest ready, you will then need to put it in a secure and warm spot. The house should be between 4 and 7 feet off the ground. The location of your mason bee house is very important. It is relevant even when you have purchased mason bees. A good location will attract mason bees quickly. It also keeps the colony protected in some ways. A good location should be where water cannot reach the mason bee nest. It should also allow for sunlight to reach the nest at some times, especially in the mornings. The location of your nest should not be too windy or cold in winter. You may choose to elevate your mason bee house. Elevation keeps predators from reaching the nest. Some predators of mason bees may eat brood and adult bees. Those that eat brood destroy the nest. Predators that eat adult bees, such as birds, may be prevented from attacking the nest by having a mesh around your mason bee house. Disease and pests make up the other significant threat to mason bee populations. Keeping mason bees requires you to inspect the nest to identify such pests and diseases early. Some mason bee pests may be controlled by washing cocoons and regularly cleaning up the mason bee house. The benefits of mason bees are at your reach once you have attracted them. Around your mason bees, you may keep a few flowering plants. Wild flowers are most suitable for this. The flowers provide pollen and nectar for mason bee food needs. Female mason bees stockpile pollen and nectar in cells where they then lay eggs. Hatched larvae require the nectar and pollen for food before spinning a cocoon and developing into an adult. Mud is another item that is very useful in how to attract mason bees. It is used by the bees to construct the nest and cells. Mason bees nesting in modern commercially sold mason bee houses also need mud. You could provide an open patch of wet mud for the mason bees near their nesting site. With this resource nearby, your mason bees will build their nests faster once they settle in. To build a mason bee mud source, dig a hole in the ground and line it with waterproof material such as polythene paper. After lining the hole, return the soil you dug up back into the hole and add water. You should always keep the mason bee source wet throughout. Farmers and beekeepers may have their own unique ways of building a mason bee mud source for their bees. You may add to the quality of your mason bee mud source by adding some mud mix. The mud mix is easy to buy from beekeeping supplies retailers. You may also purchase a mason bee mud mix online from trusted sellers. Mud mixes come with instructions for use. They are easy to use and work well for both amateur and professional mason beekeepers. There is an average of 200 mason bee species found in varying distribution around the globe. Mason bees are great pollinators, and are easy to keep. Starting mason beekeeping requires beekeepers to know how to attract mason bees. You may also buy a mason bee starter population. The red mason bee found in Wales and England is endangered. Mason bees live in structures called mason nests or mason bee houses. They build a nest using mud as bricks. Mason bee houses are commercially produced and sold. There are a variety of mason bee houses you can choose from. 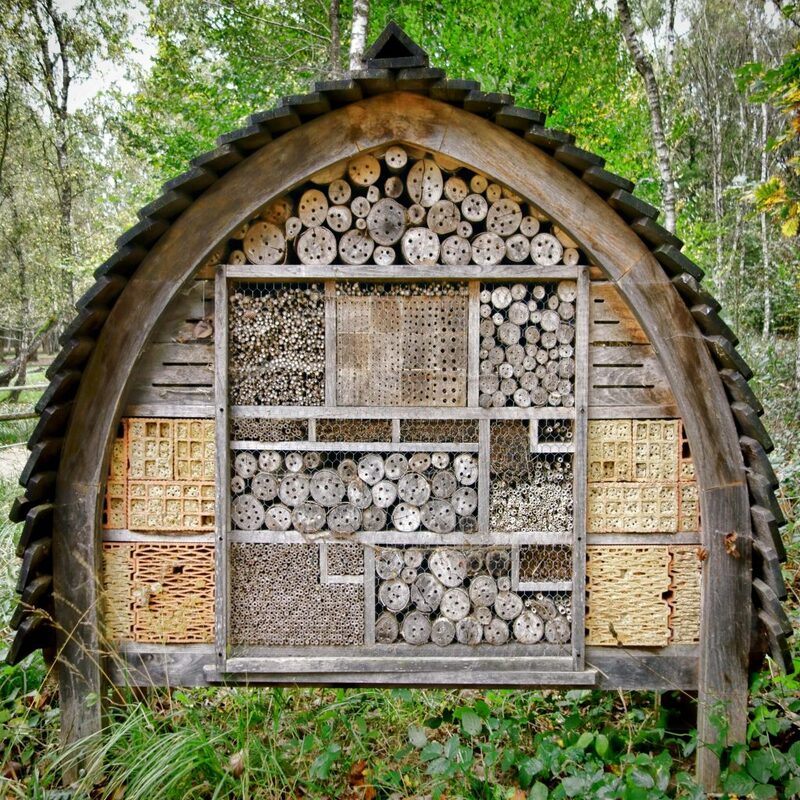 Popular mason bee houses use bamboo, wood and paper as the foundation material. On their own, mason bees may build a nest on a wall under the eaves of roofs. Such nests have no underlying material. Wood is the natural habitat of mason bees. They are found in the wild colonizing wooded areas. 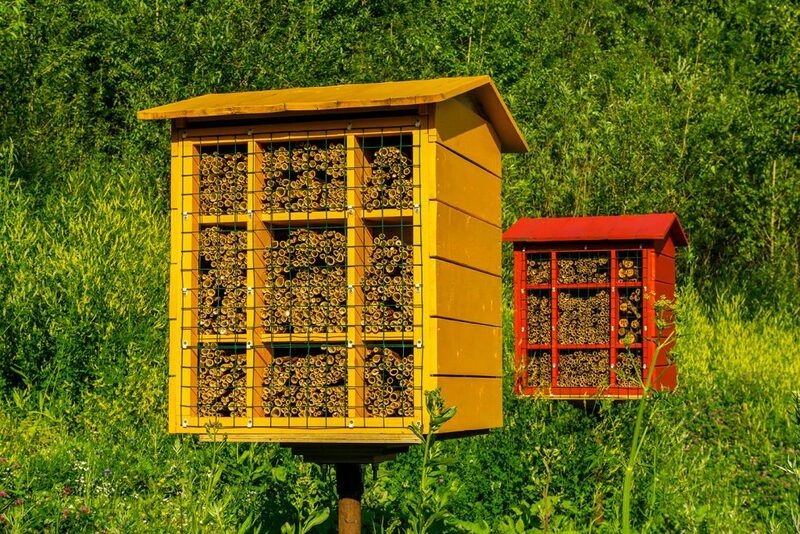 In urban environments, mason bee houses use wood to provide a near-natural nesting material. It is also why mason bee houses are best hung on tree limbs, wooden posts or wooden buildings. Mason bees are found in mostly temperate regions around the world. They are active and easily seen from spring until late summer. The life cycle of mason bees takes one year after which the bee dies. The cycle begins at egg stage and transitions through larva and pupa stages. From the mason bee cocoon of the pupa stage, the adult emerges. 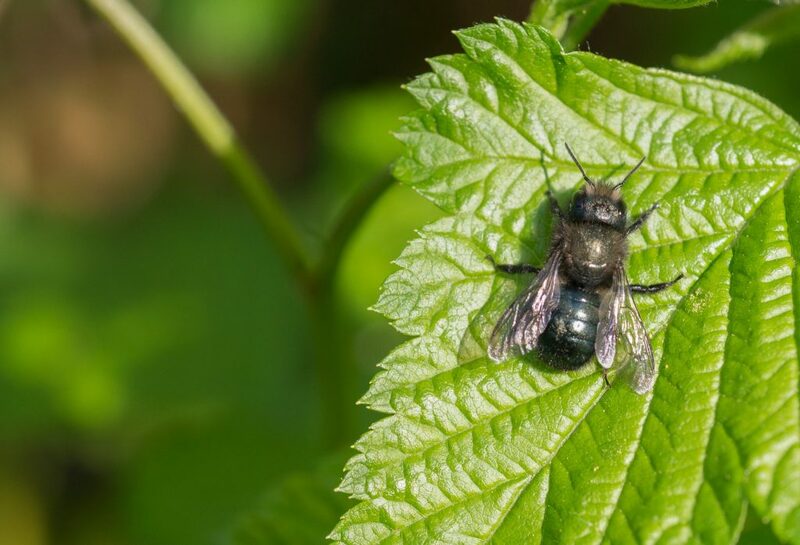 Male mason bees fly about for up to 3 weeks. Females have more to do and fly for between 7 and 8 weeks. Female mason bees lay up to 35 eggs. She places them in an arrangement that sees female eggs deeper in the hole they choose for a nest. This allows males to emerge first and wait for the females to emerge. Mating takes place soon after females emerge from their mason bee nest cells. Narrow pipes are best suited in making mason bee houses and nests. The bee takes well to narrow spaces and builds cells in the pipes and tubes provided. Mason bee houses come in many designs. The best mason bee houses have their pipes and entrances in irregular arrangements. 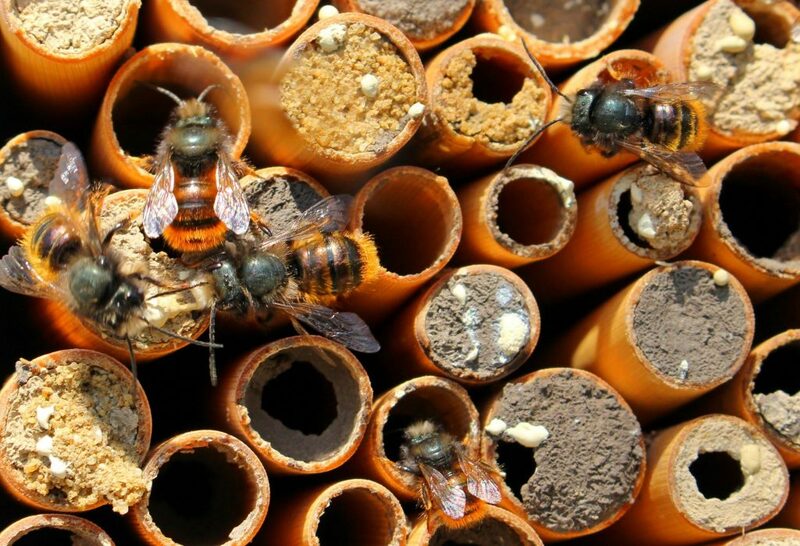 An irregular arrangement of pipes helps mason bees find their individual pipes and entrances easily. Some mason bee houses have the pipes on the upper part longer than those on the lower sections to shelter them. Mason bees are solitary bees, but they build nests near each other. A single nest may have thousands of mason bees living in it. A mason bee builds its nest in the same location from which it hatched. 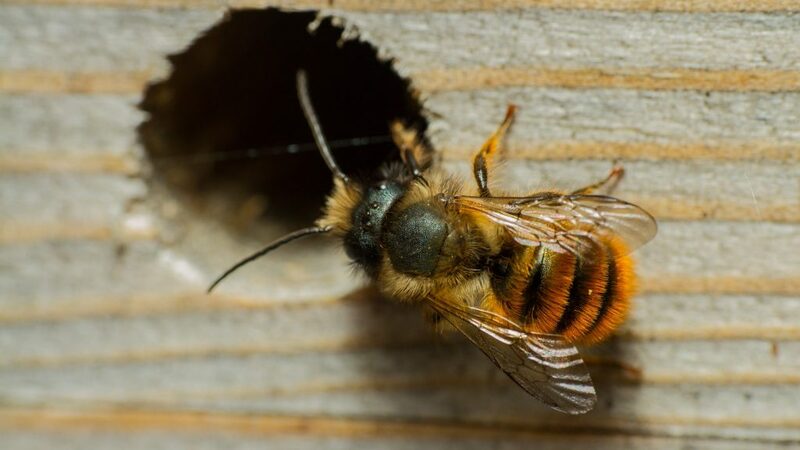 They also have an interesting life cycle that sees male mason bees getting out of their cocoons and nest cells first, to mate with the females emerging from the same nest. There is a variety of mason bee houses and nests available to those interested in keeping mason bees. The houses attract a variety of accessories for them including nest tubes, hanging hooks and mud cookies. The life cycle of mason bees has a period when adult bees are emerging from the nest cells. It follows the cocooned pupa stage. Mason bees emerge in spring and can fly in cooler temperatures compared to honey bees. In cool weather, it may take up to two weeks for all the adult mason bees to emerge. Mating follows soon after. Mason bees in their cocoons look like adult bees by late autumn. They however remain in their cocoons until winter is over. During this time, the mason bee is in hibernation. As winter clears and the weather warms in spring, the adults break through their cocoons and emerge out into the open. Mason bee nest cells are arranged in a way that the last laid male eggs are at the outer areas of the nest. They emerge first. Successive adults emerge from their cocoons and only need to cut through a single mud plug. The seal of one mason bee nest cell forms the back of the next cell where an egg is laid. Once they emerge and mate, female mason bees begin nesting within 3 days. They collect pollen and nectar and store it in cells with a single egg. They then plug the cell with mud. The plug forms the back of the next cell. Female mason bees repeat this process until they have filled nest tubes with eggs or build a large enough nest if in the wild. Some mason bees line their cells with flower petals. After finishing the nesting process in about 7-8 weeks, the female mason bee dies. The eggs she has laid will hatch and continue the cycle. All female mason bees are fertile. There are no worker bees among mason bees. After mating with females and flying around for 2-3 weeks, male mason bees die. Mason bees live on the pollen and nectar found from plants. Adult bees forage for nectar and pollen for their nest cells. They seal it up in individual cells placed together with a single egg. Once the egg hatches, larvae eat up all the pollen and nectar they find in their cell and then spin a cocoon to enter the pupa stage. Beekeepers should provide adequate foraging grounds for their mason bees. This involves providing foraging plants by growing flowers that are beneficial to mason bees. The best flowers for mason bees are those with a single row of petals. More than one row of petals is too many petals that hinder the mason bee from reaching pollen. Composite flowers with open petals are especially suited as foraging plants for mason bees. They allow your mason bees easy access to pollen. Beneficial pollen flower plants in the Ericaceae family are grown by farmers and beekeepers that are raising mason bee populations. Such flowers include asters, poppies, black-eyed Susans and alyssum. In spring, you may have some hyacinth going as your mason bee pollen plants. Bee balm is suited as the foraging plant for your mason bees in summer. To achieve the most out of providing foraging plants for mason bees, plant the flowers in a large section. Flowers growing together encourage foraging. They are easier to smell and see, thus your mason bees will get to them easily. There are two configurations of growing mason bee foraging plants. You may have different types of plants planted in a group in one area. You could also have one type of plant only, planted in a clump. Mason bees are being increasingly kept for their pollination activities. Raising mason bees can be done by both farmers and beekeepers. The level of experience or beekeeping know-how that you have should not deter you from taking up mason beekeeping. By following various guides and education resources that you easily find online (such as this) and in beekeeping stores, you can raise a healthy nest of mason bees and keep it going for years. To learn how to raise mason bees, you should be prepared to read a lot about it. Professional and experienced beekeepers easily take to mason beekeeping. Some concepts of honey beekeeping marry with keeping mason bees. You should however note that mason bees have their differences with honey bees. To raise mason bees, purchase high quality equipment only. This includes the mason bee house you choose. A high quality house will give you a healthy mason bee nest. Mason bees only sting you when they are in duress. For mason beekeeping, you may not need heavy beekeeping suits. A face veil is often adequate protection when working with mason bees. You may attach the veil of your choice to a beekeeping jacket or smock. A healthy nest of mason bees is important for the continuity of the nest. Keeping mason bees requires you to carry out management of the nest, and periodically deal with pests and diseases. Once you have a mason bee population colonizing your mason bee house, it has the potential to be full of mason bees for years on end. Pests of mason bees attack the larvae and pupa. They may harm the larvae or prevent the pupae from reaching the adult stage. Beekeepers use various methods to clear their nests of diseases and pests that cause harm to mason bees. Beekeepers may set up a mason bee house and wait for mason bees to colonize it naturally. Those in need of moving faster may purchase a starter mason bee colony. It is sold in form of mason bee cocoons that you put in your mason bee house and allow to emerge. Cocoons are best not exposed to cold temperatures. While refrigerating cocoons may slow development until you are ready, it also carries with it the risk of killing the pupa of mason bees inside. Purchase your mason bee cocoons when you have a house ready to receive them. High temperatures too are injurious to mason bees, but these are rarely reached in a natural and well aerated mason bee house location. Raising mason bees needs only about 2 hours of your time in a year. Setting up a nesting house takes you not more than half of an hour. You can do it in one day and have mason bees living in it within a short time. You do not need complicated bee hives to keep mason bees. You may bring in your mason bee house into the house or garage during cold weather to protect it from the elements. Harvesting of cocoons for mason beekeepers who are interested in such takes no more than 45 minutes. Environmental threats to mason bees include pesticides. Farmers and beekeepers with mason bees should avoid using harmful pesticides on their flowers and plants where mason bees may go foraging. The pesticides may kill mason bees or leave them in a weakened state. Weak mason bees do not make enough nest cells to keep a mason bee nest going constantly. There are other threats to mason bees that you should prevent and remove. Predators that prey on mason bees may cause you a big setback in mason beekeeping. Birds eat adult mason bees. Some predators eat larvae and pollen stored in mason bee nests. Keeping mason bees is a useful and interesting activity. It can be done by both experienced and beginner beekeepers. Having mason bees is great for your plants and home garden. A modest nest of mason bees will keep your plants well pollinated even with absence of other pollinators. Use the information and tips in this guide on how to attract mason bees to keep a vibrant mason bees colony. It will save you time and tiresome labor costs that you would incur by having to hand-pollinate your plants. Do you have experience with keeping mason bees? Share your thoughts in the comments below.